"Wow. Just wow. What wonderful pieces. That skirt and coat are so such classic shapes and they work wonderfully on you. (Then again a paper bag would probably look fabulous on you.) Beautiful hair. I am trying to grow mine out and locks like yours keep me inspired. Love that locket. Lucky you!" Kait, that was one of the nicest things anyone has ever said to me! You made me grin from ear to ear. Thank you, thank you, thank you! I tried a new hairdresser this time. I'm always wary of going to new places because I find that hairdressers can sometimes be scissor-happy and cut off far more than what I've asked for. Also, my hair has got a natural wave and I like to be low-maintenance (i.e. I can't heat style my hair every time I wash it!) and some styles require a lot of upkeep. 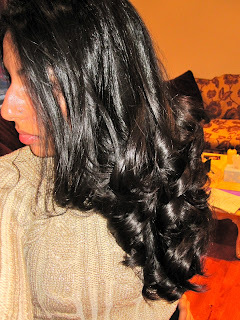 I was really happy with this hairdresser, though - she only cut an inch off (although it probably looks like a lot more because she styled it with curls) and she really listened to what I asked for. 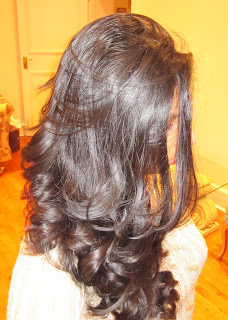 Of course, hair always looks great when it has been blow-dried at a salon! The true test of a great haircut is to wash it yourself - which I haven't done yet - so I might be singing a different tune tomorrow! She also said my hair was in great condition - what a compliment! I've written about long hair care before. In a nut-shell: use heated tools infrequently, don't wash your hair too often (I wash mine about 2-3 times a week), and deep-condition when you can! 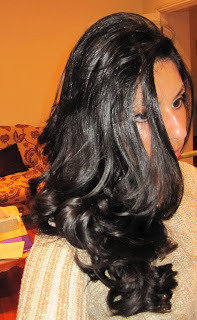 I usually get my hair cut into long layers - they are easy to maintain and easy to style. I look ridiculous with bangs so I steer clear of them! Where do you get your hair cut? Do you have a tried-and-tested style, or do you experiment? P.S. Do you remember the Swishing Party I went to last month? Well, Russella, the unforgettable drag queen, has just released her single on iTunes. It's called Too Fabulous. Check it out if you're into electronic music! Love the haircut - it looks great. Very bouncy and shiny! Wow, your hair is amazing, darling! don't you just love russela? haha :) such a good song! Your hair looks beautiful. I have wavy/ curly hair too but can never get it to look so glossy. I have really trouble finding a hairdresser that doesn't blow dry it into a frizz. Oh, I'm so filled with hair-envy now! Those are the exact kind of curls I want for my hair! I just went and permed my hair but your curls are SOOOO much nicer!! Your hair is so pretty and shiny! I love the haircut and all the curls! It's absolutely gorgeous! I know what you mean about trying a new hairdresser. It can definitely be a tricky thing since a new person might not give you what you want. I go to a hair salon that is local to my part of Maryland. It's a bit on the expensive side, but worth it since I know my stylist will do a good job. :) I used to experiment with my hair color when I was in high school. But since then I've just stuck to simpler styles I suppose. Fantastic hair! I work in a salon and your hair looks so gorgeous!!! Thanks for all the sweet and kind comments as usual. woah incredible hair, it's stunning! looks in such fabulous condition and very effortless, great cut. I always end up hating the style the hairdresser dries my hair in because i guess a professional dry always makes it sleek, so it goes straight! straight looks terrible on me! i ruined my hair when i straightened it for about six months in the first year of uni, before that it had no products or heat on it ever, i didn't even blow dry it! ah those were the days! i hope your style looks just as great once you wash it the first time! Hey Leia! I hadn't realized you weren't feeling well! I'm sorry to hear that! You are in my prayers, and hopefully Friday you can find out what is going on,and that there is an easy solution! Hang in there! Also, I love how your hair looks curled like that!! I love how my hair feels right after they style it at the salon too, but I know what you're saying about it being different after you wash it at home! You hair looks fabulous though! Glad you're feeling better Leia... I really think we're soul sisters. Hahaha! We got sick at the same time. I love your new haircut. And you always have fabulous, healthy hair. Oh Leia, your hair is beautiful! i always wanted to have some waves on my hair.. but mine is just too thick and straight, straight, straight! Anyway, i hope your doctor appointment goes well on Friday. Gorgeous haircut! I've been having mine done like this recently and it really makes you feel glam, doesn't it?! oh my god! how shiny can your hair be! I thought I was practically the only one who has never tried Mac makeup!! It's good to hear I'm not the only one! I know a lot of bloggers wear it, I just have never given it a try! Great tips, as always! Looks like I've washing the hair way too often, but then again I use a lot of product. p.s. Feel free to enter the “Starving For Dior” contest on my blog! It's been said a million times, but seriously, your hair is so gorgeous! A hairdresser that listens to you is worth millions, sounds like noe to stick with! I get bored of hairdressers quite quickly and tend to move around a lot, which is probably the opposite of what I should do to get good hair, but my most recent one is still favourite at the moment! Sorry you're still not feeling well though, I hope the doctor sorts you out. *also* how fantastic about Rusella?! I will have to give it a listen! woooahhh! You have the prettiest hair ever!! *cue jealous face* Gosh it really is gorgeous. I always find the complete opposite with my hair. The hairdresser makes it look awful and I have to style it myself before it looks good! Your curls are amazing though. Gorgeous curls, I never am able to reproduce my hair style, I don't know if it is the cut or my lack of skill. Hope you are luckier, such a pretty cut! Your hair is just so so speechless. Wow! those curls and just beautiful! gorgeous cut. You have beautiful hair. You have to try Philip Kingsley products. Total hair envy. My hair could NEVER look that amazing! Honestly, it's been a year since I had my last haircut. I really have to do it soon.